that the Norwegian alphabet has 3 "extra" letters, namely Æ, Ø and Å. They are the last 3 letters of the alphabet. In other words, Ø is not the same as O. Link to ships starting with Ø can be found in the alphabet index at the end of this page. Built in Hamburg 1938. Delivered in Aug. as O. A. Knudsen to Skibs-A/S Marie Bakke, Haugesund. All my information on this ship (incl crew list) has been assembled on a separate page - see M/T O. A. Knudsen. See M/T O. B. Sørensen (incl. a picture). See D/S Octavian (w/crew list). Built at Vegesack, Germany 1939. Please continue to M/S Ogna for more information (including war voyages). Built in Hamburg 1938. Previous name: Le Havre until 1939. See M/T Ohio (w/pictures of the ship). Built in Middlesbrough 1921. Previous name: Rigi until 1929. My page about D/S Olaf Bergh has details on some of her convoy voyages. Built in Helsingør, Denmark 1936. M/S Olaf Fostenes has more information on this ship, as well as an account of her final fate with a crew list at the time. Built in Gothenburg 1943/'45 (ordered 1938). Launched in 1943 but laid up in Juvik unfinished (sister ship of Sofie Bakke and Knut Bakke). Picture of Olav Bakke - Source: Bjørn Milde's postcard collection. POST WAR: Delivered on Sept. 10-1945 from A/B Götaverken, Gothenburg as Olav Bakke to D/S A/S Jeanette Skinner, Haugesund (Knut Knutsen O.A.S.). 5868 gt, 8570 tdwt, 456.8' x 58.7' x 26.5', 7 cyl. 2 tdv Götaverken-B&W, 8000 bhp, 16.75 knots. Aground on Oct. 27-1959 at Negritas Rock off Buenaventura, on a voyage from Antwerp to Valparaiso with general cargo, later broke in two. ("Våre motorskip", Leif M. Bjørkelund & E. H. Kongshavn). Built in Wilmington 1943. Previous name Sallie S. Cotton until 1943. Captein Leif Christian Krogh. On a voyage from Singapore to Suez with a cargo of 10 000 tons aviation fuel when she was captured by the German auxiliary cruiser Atlantis on Nov. 10-1940, position 06 30N 90 13E. Please go to my page Norwegian Victims of Atlantis for a lot more details on this incident, including crew list, excerpts from the maritime hearings, and her subsequent history and fate, as well as information on all the other Norwegian ships captured by this raider. NOTE: Norwegian sources state that the crew from Ole Jacob (and M/T Teddy, captured by the same raider) were freed through diplomatic avenues (again, there's more details on the page mentioned above). However, I've been contacted by an Australian man who says his Norwegian father, who was on board Ole Jacob, was definitely not freed, but ended up in Japanese camps. His message can be found in my Guestbook. If anyone can shed some light on what happened to the crews of Teddy and Ole Jacob, please contact me (my contact address is at the end of this page). S.S. Automedon - The Ship That Doomed A Colony - Details on events surrounding final fate of this ship, as well as the role Ole Jacob played in connection with the secret documents found on board Automedon (the main page is Force Z Survivors Association which also has a lot of information on the fate of HMS Prinse of Wales and HMS Repulse with crew lists, online forum and much more. Built in Newcastle 1914. 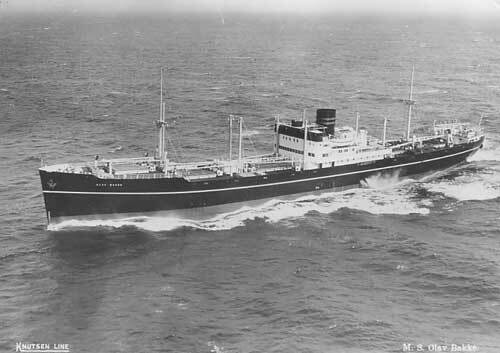 Previous name: San Lorenzo 1928 (tanker). Here is some pre war history, while details on her WW II fate can be found on my page Norwegian Victims of Pinguin, which inlcudes a crew list at the time of capture in Jan.-1941, and 2 pictures, 1 of which shows her under German control. Built in Bergen, Norway 1906. My page about M/T Ora has more information. Built in Moss, Norway 1919. Previous name: Avilesino until 1926. Built in Odense, Denmark 1933. Read more about Oregon Express, includes a picture and information on her final fate (w/crew list) in the battle for convoys ON 202 and ONS 18. Built in Fredrikstad, Norway 1922. Delivered in Aug.-1922 from Fredrikstad Mek. Verksted as Orm Jarl (236) to Det Nordenfjeldske Dampskibsselskab, 1849 gt, 1093 net, 2830 tdwt, 277' 9 1/8"/265' (loa/lpp) x 42' x 20'/27' (D/D1), 2 steam turbines by Krupp A/G, 900 ehp. Placed in the company's Mediterranean Line. Sister ship of Einar Jarl (II) and Ottar Jarl. (Nordenfjeldske D/S fleet list, Finn R. Hansen). In collision with the French steamer D'entrecastaux (misspelling of D'Entrecasteaux?) and sank on March 4-1939 off Kruisshaus Sluice, River Schelde, when on voyage from Ghent and Antwerp to Piræus with a cargo of copper. The wreck was later removed. Their first Orm Jarl was built in Sunderland in 1888, delivered as Hamburg to Førnyade Ångfartygs A/B (Svenska Lloyd), Gothenburg, 799 gt; sold to Nordenfjeldske on Febr. 12-1913 and renamed Orm Jarl. Ran aground near Alden on Dec. 31-1919 and broke in two, total loss (some sources say Dec. 30). After the war Nordenfjeldske had another ship by this name, built in 1939 as Haga (Mathies Reederei KG, Hamburg), 1309 gt, in Hamburg-Stockholm service. Taken over by Ministry of War Transport, London in 1945 and renamed Empire Consumer. Handed over to the Norwegian State in July 1946 as a replacement for war losses, renamed Hauknes. Sold to Nordenfjeldske on Febr. 10-1947 and renamed Orm Jarl (III), placed in the company's Mediterranean service, later in service to Hamburg. Had 3 more owners between 1958 and 1967 and the names Travnik (Yugoslavian), Komovi (Yugoslavian) and Moschoula (Greek) - deleted from register in 1970. Orm Jarl (IV) was delivered in May-1961 (bulk carrier, built Malmö), 16 450 gt. Sold in Febr.-1966 and renamed Star Geranta, then Geranta in 1968. Sold again in 1975 and renamed Regal Sword. Collided on June 18-1979 with T/T Exxon Chester and sank off Cape Cod, when on a voyage from Portsmouth N.H. to Philadelphia. No casulaties. Orm Jarl (V) was built in Emden in 1967, 29 966 gt. Sold in 1969 and renamed Narottam Morajee, sold again in 1984 and renamed Continental Lotus; still in register in 1990, but no longer registered in 1996. Built in Glasgow 1905. Previous name: Knight Templar until 1925, converted from general cargo in 1925. Please continue to D/T Orwell. Built in Germany 1938. (Launched on Dec. 29-1937, delivered in May-1938). For more details on this ship, incl. crew list, please go to M/S Oslofjord. My page about Ottern has more information.